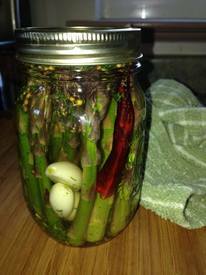 Great for serving on an appetizer plate or in a Caesar or Bloody Mary as a garnish, Pickled Asparagus is a real treat. Here’s a quick way to get a few jars put away in the back of the fridge. These are zingy, snappy and crunchy awesome!